The battle is heating up between the NDP and the Liberals as the two parties fight for the "change" vote, but if the country is indeed headed for a minority government as many polls seem to indicate, the two parties that are currently locked in an epic showdown may have to think about putting the past behind and collaborate. The battle is heating up between the NDP and the Liberals as the two parties fight for the "change" vote. The prize? Potentially winning the election. But if the country is indeed headed for a minority government as many polls predict, the two parties that are currently locked in an epic showdown may have to put the past behind them and collaborate. Any talk of cooperation — much less coalition — between the two parties is too premature, says Bob Rae, former interim leader of the Liberal Party of Canada and former NDP Premier of Ontario. "It's way too early for those conversations to take place, if they ever take place," he says. "You have a race now which, in my view, is open to any party to win a majority government. Things change, it's five weeks to go. So if everybody starts sitting around making phone calls and having conversations — I think it's ludicrous. It's pointless to do that." Rae is no stranger to negotiating and collaborating with other parties. In 1985, as provincial NDP leader, he played a pivotal role in bringing down Ontario's Progressive Conservative party by signing a "Liberal – NDP Accord" with David Peterson's Liberals. But he says on The House that those conversations with Peterson didn't take place until "about four days after the election." "The election will produce what it's going to produce in terms of seats, and at that point, people can start to talk about what kind of government will emerge from that," he says. Janice MacKinnon, former NDP Minister of Finance in Saskatchewan, says talk of cooperation is more complicated this time around because of how close the polls show the race. "Every other time we've been in this situation, there's been a clear third party," she says. "It's not true this time — they're all competitive. "What we don't know yet is who is going to be the dominant party on the left? So there's huge competition between the NDP and the Liberals right now. The idea of talking, I think, would be very, very strange because they are very much competing to be the party on the Left at the end of the day." But MacKinnon is optimistic the NDP and Liberals could find areas of cooperation in a future minority Parliament. "There's lots of common ground they have on which they could work together," she says. "They both want to get rid of income splitting for families, they both want to scale back tax-free savings accounts, they both want to expand the Canada Pension, they want a different approach to the environment, they want a different approach to relations and funding for First Nations and even some foreign policy commonalities." 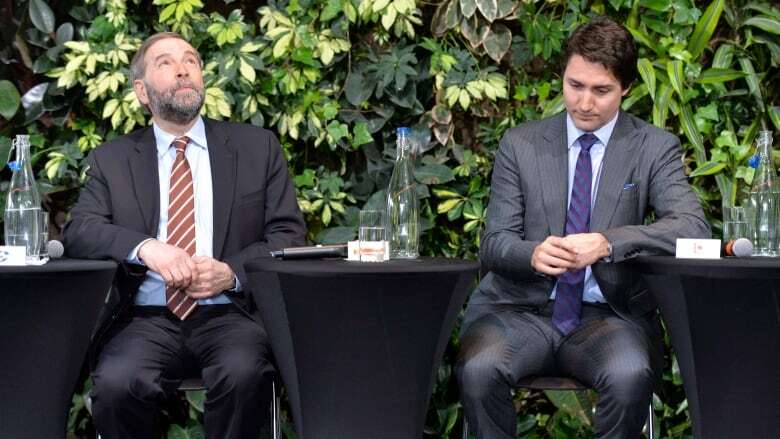 Rae isn't so sure, pointing to the Liberals' economic policy, which is built on the premise of growing the economy through investments in infrastructure, as a marked departure from the NDP's commitment to balance the budget. "I think what Mr. Trudeau is offering is a very progressive change," he says. "I still think the Liberal policy, at the moment and in the current circumstances, is the one that makes the most sense." MacKinnon agrees that Trudeau's economic plan "is easy to distinguish from the other two" but says his commitment to infrastructure isn't strategic. "I think really, if you look at it, this isn't stimulative spending. It's just a lot of spending," she says.